Hey .... I am almost as cool as Johnny Depp! Scarface3133 and jolurove like this. I was actually supposed to get it 2 weeks ago but my post office decided it would be funnier not to leave a notice and let me contact the seller for details... French post is a jerk. soulbazz, OhDark30 and vdr74 like this. I really like that dial! cool Komandirskie WFH! My latest catch. Can't tell from the picture but the one on the right has a gold colored case and bezel. Last edited by howardvu; September 7th, 2013 at 22:55. 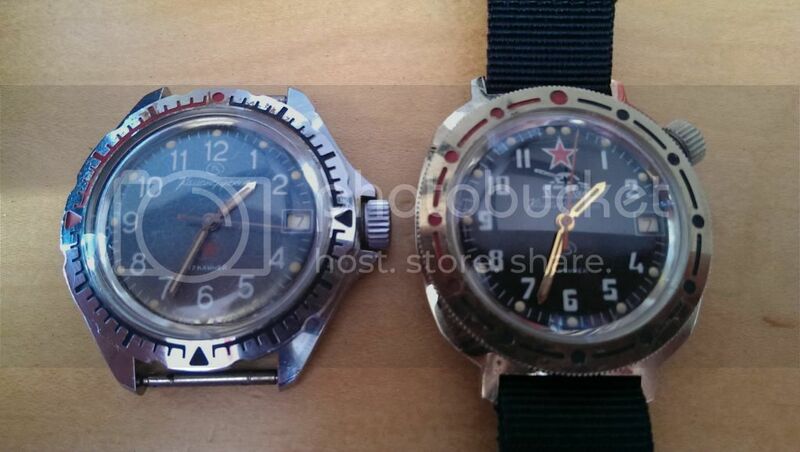 I need one of those older MO CCCP 3AKA3. I just noticed this listing on Ebay of a nonworking beaten Paratrooper, so surely yours is not unique! JRMTactical and OCDood like this. That's cool to see....now we know its not just a one time thing. Good catch Arizone! soulbazz, schnurrp, putra3007 and 3 others like this. Hey! Here's your tank's little brother! OhDark30 and starman69 like this. sq100, OhDark30, jolurove and 1 others like this. « Anyone bought on the Bonanza site?